Everyone has their favorite colors, but believe it or not sometimes the colors of the clothing we wear tells a lot about our personality. You may not give much thought to the colors of the clothing that you decide to put on, but sometimes the colors of what you choose to wear can either work to your advantage or to your disadvantage. The next time you head out for the club, bar, on a hot date you should take some time to think about not only what you’re wearing but also the colors of what you’re wearing. If red is your go-to color, it may tell women that you’re dominant and like to be the center of attention. 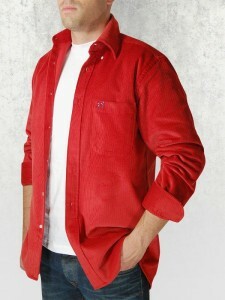 This is a great color choice if you want to stand out in at a club or bar. Red is the type of color that demands attention and displays confidence. If you want women to notice you from across the room, then you should definitely consider adding a few red items to your wardrobe. However, you be forewarned that red is not a color that you want to wear every day. Too much red may signify that you are a control freak with an overly dominant attitude, which will clearly send women running in the opposite direction. Black is the go-to color for practically all men. It’s a simply color that still manages to be eloquent and is expresses authority. If a woman sees you in black, she may think you’re mysterious. She may also think that you’re capable of blending in with your surroundings as well as taking control when you need to. If you don’t have any black in your wardrobe, we recommend that you add it immediately. You can never go wrong with black, whether it is jeans, slacks, or a button-up shirt. However, make sure you aren’t layering black on black unless the colors match perfectly. Two non-matching blacks stick out like a sore thumb and ends up having a negative affect. White is a tricky color for a couple of different reasons. The most obvious reason is that it is difficult to keep clean. It seems like the moment you put on something white, a second later you end up with a stain on it. Not only is white hard to keep clean, it also tells women that you have a level of order about you that can be a turn off to some women. Of course, if you manage to get your white clothing dirty, it will tell women that you’re sloppy and don’t pay attention to the things going on around you. We recommend reserving white for basic things like undershirts. Honestly, we think that blue is the top color to wear when you’re looking to meet women. Blue seems to have a calming affect on most people and it also gives off the impression that you’re easy to approach and trustworthy. Blue is the type of color that makes women feel comfortable around you, so don’t be surprised if you end up having a one-night stand every time you wear a nice blue shirt. No matter what colors you like, it is always best to have a closetful of choices for various outings and events. This will make it easier for you in the long run and you can even wear certain colors for when you’re in a certain mood. When you do this, you can tell women about how you’re feeling without ever having to open your mouth.